As a part of HM the Queen’s Diamond Jubilee, H&H were commissioned by Lord Sterling to undertake the decorative and art works for the Queen’s barge Gloriana which led the flotilla on the Thames Pageant day. The new built wooden vessel, the first Royal barge built for over 250 years, required detailed research to ensure that protocol with the Royal Household and the College of Arms were acknowledged. The decorative design was created to reflect the tradition of historic Royal barges whilst also incorporating references to HM the Queen’s 60 years as reigning monarch. Personalised tributes were added in recognition the long lasting marriage and support from HRH The Duke of Edinburgh in the form of the emblems of the Lord High Admiral which can be seen painted either side of the rear cabin entrance. The side of the vessel was decorated and gilded with a trompe l’oeil vitruvian “wave scroll” supported by gilded dolphins and heavily gilded ornamentation to the aft section. The cabin exterior is clad with fluted pilasters and gilded Corinthian capitals with centralised hand painted national emblems of each of Her Majesty’s 16 realms of the commonwealth, as well as the flags of England, Scotland, Ireland and Wales. The Royal crests were painted and gilded over both cabin entrance’s and HM the Queens Royal cypher E11R over the stern section confirming the vessel as the Queens barge. The rear deck seat back was designed and painted in ornamented scroll work with the centralised feature of “old man Thames”. The cabin interiors were painted in soft trompe l’oeil “carved” detailing and the ceiling panels adorned with individual paintings depicting the “birds of the Thames” from estuary to source, ensuring all Thames-side London boroughs were unified in celebration. Led by MD and Project director Peter Hare, supported by lead design artist Dean Farley, H&H’s team worked tirelessly at the Grays Inn Road workshops, at dry dock and whilst floating after the launch to ensure the barge became an exemplar in standards of art and craftsmanship, suitable for a state legacy gift to Her Majesty and able to last the time as Gloriana no doubt becomes a new national monument. The almost full external gilding process that took approx 1500 books of 23.5 carat gold leaf. bank-side boroughs to be represented. The Diamond Jubilees represented: External window panel trompe l’oeil artwork of “3D-leaf diamond design”. The Duke of Edinburgh represented: Rear cabin panel artwork (external) incorporating the designs of Lord High Admiral –The honorary title of Lord High Admiral (of the Royal Navy) was awarded to Prince Phillip, The Duke of Edinburgh by HM the Queen in 2011. The historic re-workings of from earlier representations of Royal barges. The hand–painted oars (18no.) and the large rear rudder each depicting the historic theme of “sea serpents” – taken from historic records of early dolphin sightings at sea. Gloriana is a new built wooden structure, privately funded via the charitable trusts and with considerable private financial commitments. It has been an absolute joy to work on and was handed to HM the Queen on the 25th April 2012. Peter Hare was personally presented to HM the Queen on the day by Lord Sterling and guided the Queen and Duke of Edinburgh around the interior of the cabin (decorated by H&H). In attendance were also the master boat builder Mark Edwards, and Lord Sterling’s project manager Damian Byrne (responsible for the overall structure suitability and design), David Creswell (a theatrical ornamental modeling expert) and, as well as many of the other craftsman and professional bodies there on the day, eight other selected members of H&H staff were proud to be in attendance. Gloriana in itself is an incredible testament to Lord Sterling’s vision and determination and enormous appreciation must be given to those that worked and gave towards this legacy gift. 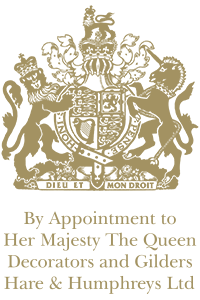 From private charitable investors and donors including Hare & Humphreys and many of the other craftspeople involved, who offered free and reduced cost services to HM the Queen and the state. It is almost unprecedented and a huge statement of respect to our Queen, that in difficult times for all, many contributed and worked so hard for a gift of thanks for the 60 years served by our monarch. In decorative terms the project was hugely demanding in skills and commitment for all involved. Decorative arts to the interior of the cabin included a series of hand-painted “birds of the Thames” themed panels, as well as ornamental trompe l’oeil paneling. The exterior ornamentation was laced with gold leaf and heraldry to create an imposing image of a modern 17th century styled row barge fit for state occasions. Insitu works were completed in the Brentford “dry dock”. Much of the gilding and all of ornamental painting, heraldry and hand painting of the 18 “sea serpent” oars were completed at Hare & Humphreys London workshops. Extreme hours were worked and the project was micro-managed to allow every hour required for each task under a heavy pressure of time. This barge could not be late!!!. Minor elements continued until late the night before the 3rd of June when Gloriana took pride of place leading the Diamond Jubilee flotilla “under oar” along the Thames. Gloriana has gained a huge response from admirers throughout the world and has shown that small industries and British craftsmanship and professionalism are not a thing of the past. The row barge will almost certainly become a National heritage museum piece shortly. To be chosen for the commission was one of the most exciting, gratifying and complimentary recognitions that Hare & Humphreys could receive in our industry. To witness Gloriana lead the pageant past the Royal gathering was breathtaking (despite the London weather)!!! Gloriana will be retained by the Maritime Heritage Trust with assistance from Thames Alive and will be used to promote better use of the Thames. This will be achieved through providing opportunities for Royal-supported, and other charities, to play their part in occasions and celebrations upon the Thames, with a particular emphasis on events involving young people. It is a great story and H&H, as well as others, are rightfully very proud of the achievements. Gloriana was conceived and commissioned by Lord Sterling and was built with generous support from Eyal Ofer, The Gosling Foundation, The Weston Foundation, and Lloyds Register. H & H are the market leaders in historic building interior decoration and restoration, with an increasingly important decorative conservation business.